Study at CGP includes four semesters (two years) of course work. Each semester requires a minimum of 12 credit hours. Students must complete a successful summer internship, thesis and exhibition project. Students take core classes as a cohort and have the opportunity to take at least one elective or independent study each semester. 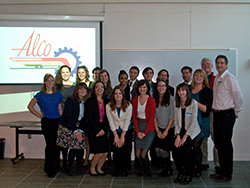 The Class of 2014 presents their strategic plan for the American Locomotive Company (ALCO) Historical and Technical Society as part of their Intro to Museums course. 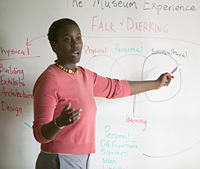 Sylvea Hollis ('06) describing the different ways visitors experience museums. 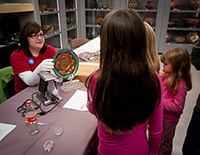 Jessica Mayercin ('13) shows visitors a seder plate during the CGP program "Night at Our Museum" held at the Fenimore Art Museum as part of the Applied Museum Education course. 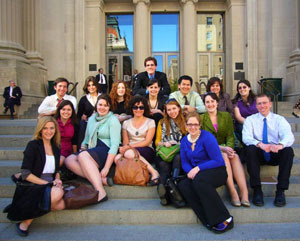 Class of 2011 on the steps of the Metropolitan Museum of Art during their New York City.